As you and your significant other choose wedding bands, it’s important that you take the time to find a band that perfectly represents your style and personality. If either of you want a diamond wedding ring, one of the biggest decisions you’ll need to make is the diamond cut shape. One of the most popular shapes has been the princess cut. Luckily, there are princess cut wedding ring sets for men and women! 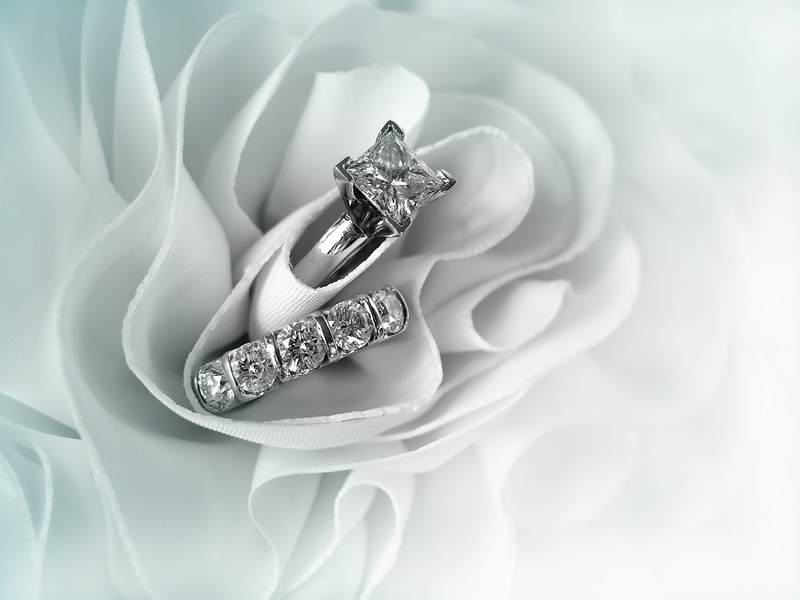 Why Should You Choose Princess Cut Wedding Ring Sets? Each diamond shape speaks volumes about the person who is wearing it, so before you commit to a princess cut, make sure it matches who you are. Princess cut wedding ring sets are worn by modern couples that love embracing new things, but still have an appreciation for tradition and classic styles. 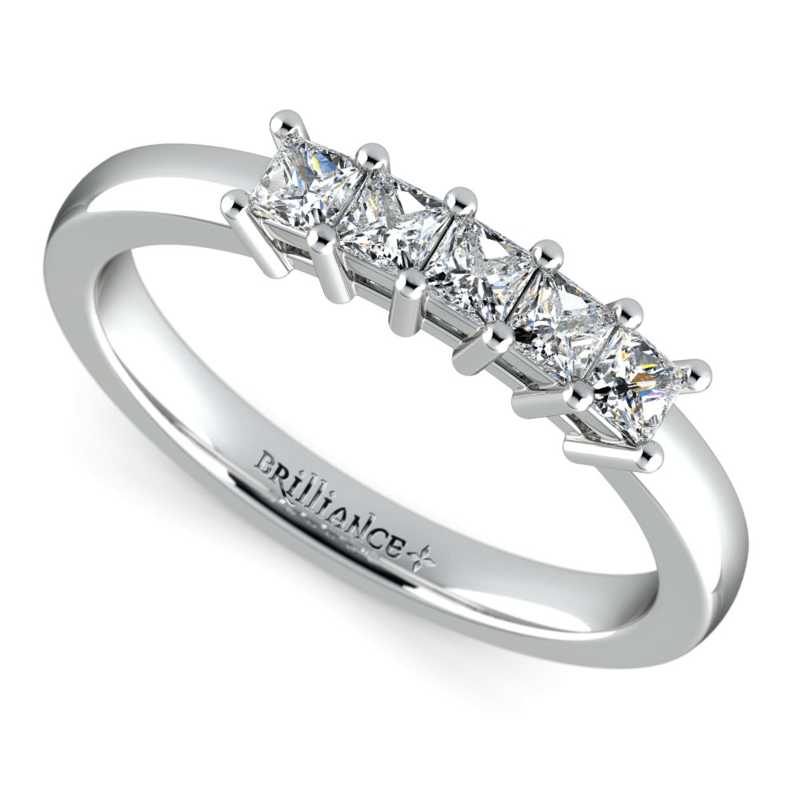 The sleek and sophisticated princess cut shows the world you have subtle elegance and refined taste. Are you a couple that likes to set trends instead of follow them? 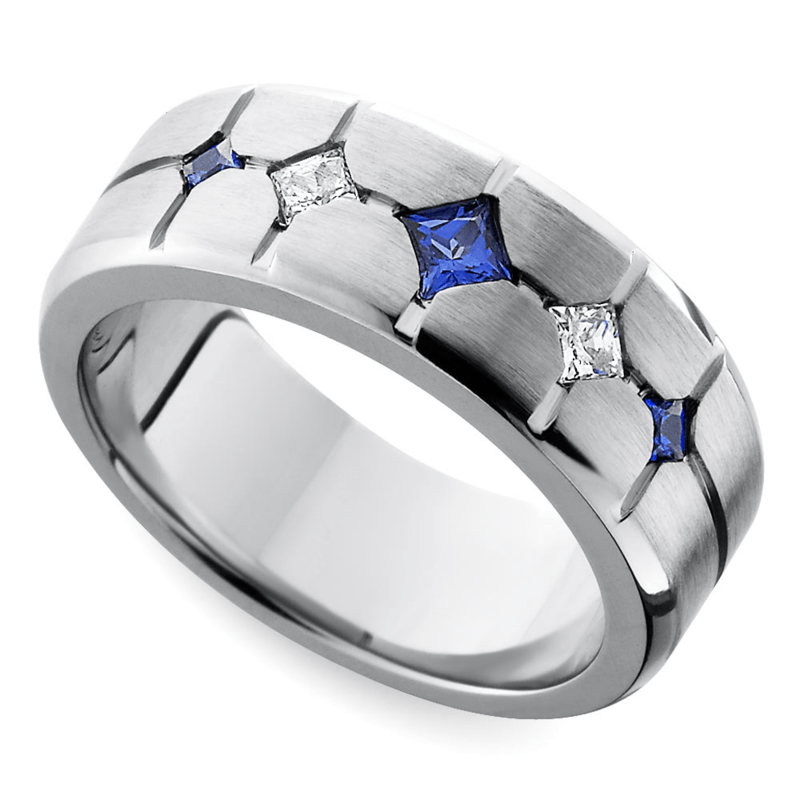 Combine the classic look of the princess cut diamond with an edgier style ring, such as this Cross-Cut Satin Sapphire Diamond Wedding Ring for him, and this Princess Five Diamond Wedding Ring for her. Men typically opt for solid bands without much detailing, so this bright and colorful men’s band will definitely show the world you are confident in yourself and your style. The five diamond wedding ring for her makes the classic five diamond style contemporary with the sleek edges of the princess diamonds. Together, these two bands complement each other and make a bold personal statement about you two as a couple. If you and your significant other prefer classic styles and shapes, these two rings are an ideal fit. 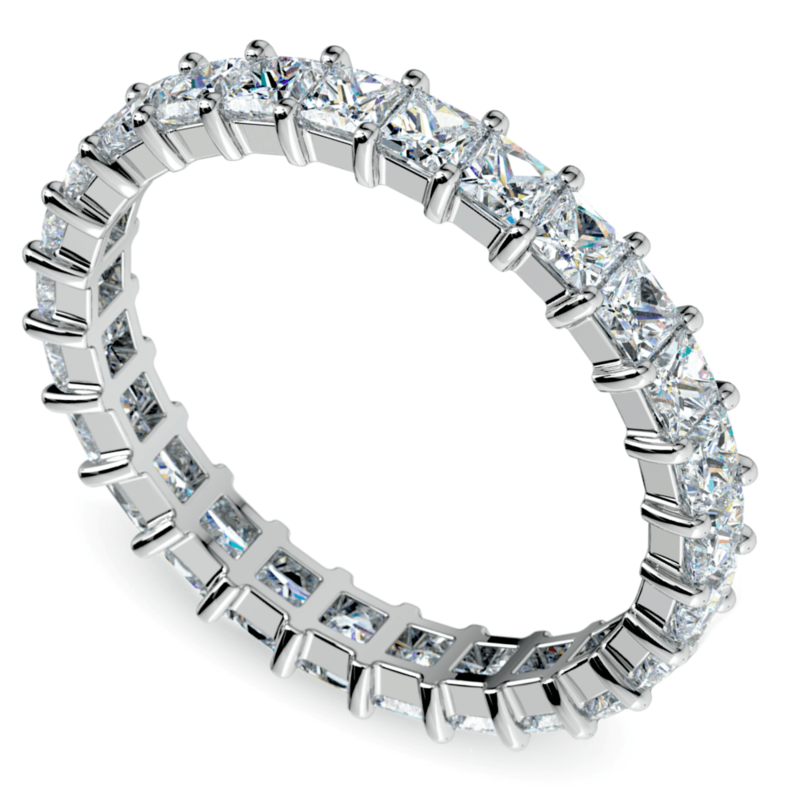 The Princess Diamond Eternity Ring for her is a classic style that will be popoular for decades to come, so you never have to worry about feeling outdated. 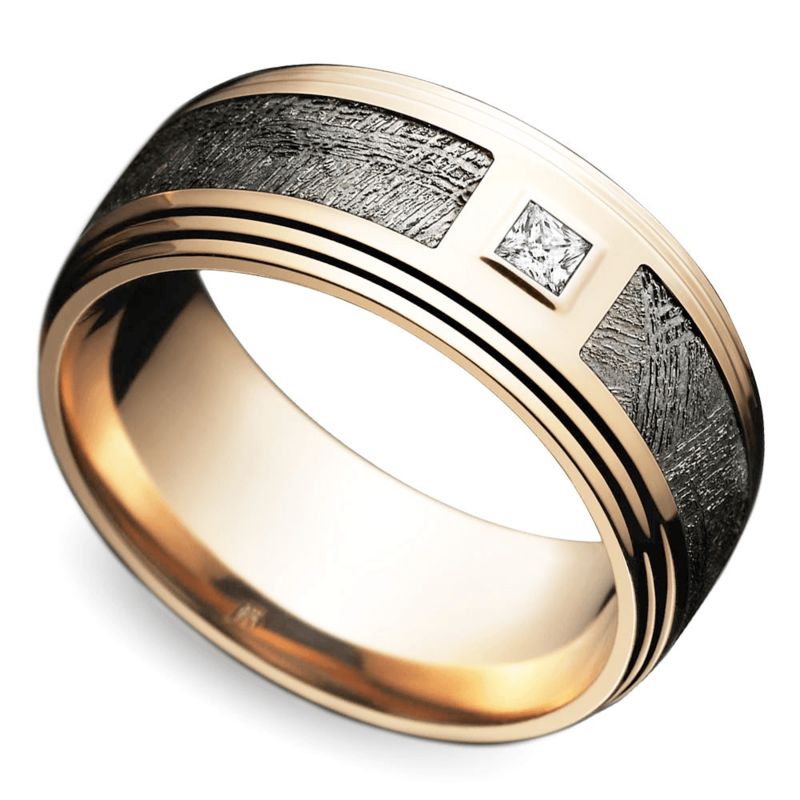 The Grooved Edge Diamond Wedding Ring for him strikes a perfect balance between modern and retro. The single princess cut diamond in the center of the ring adds a bit of sparkle while still maintaining a strong, masculine feel. Don’t be afraid to mix different metals. Both of you do not need to have the same metal type or color, so it’s ok if one of you opts for white gold and the other yellow. Ladies, make sure you try on your band with your engagement ring to make sure they look good together. They don’t need to be an exact match, but you want to make sure they don’t clash. A round cut engagement ring and channel princess cut wedding ring may pair beautiful, but a wedding ring with a higher mount may not. Let each other have fun with picking out a ring, and don’t discourage your significant other from getting a band you are not a fan of—unless it’s way out of your budget, of course. No matter which wedding set you choose, you can always add an extra special touch by engraving a personal message to each other inside the band. You can never go wrong with a princess cut diamond, so trust your instincts and pick the one that speaks to you the loudest!